Marie Watt (b. 1967) is an American artist. 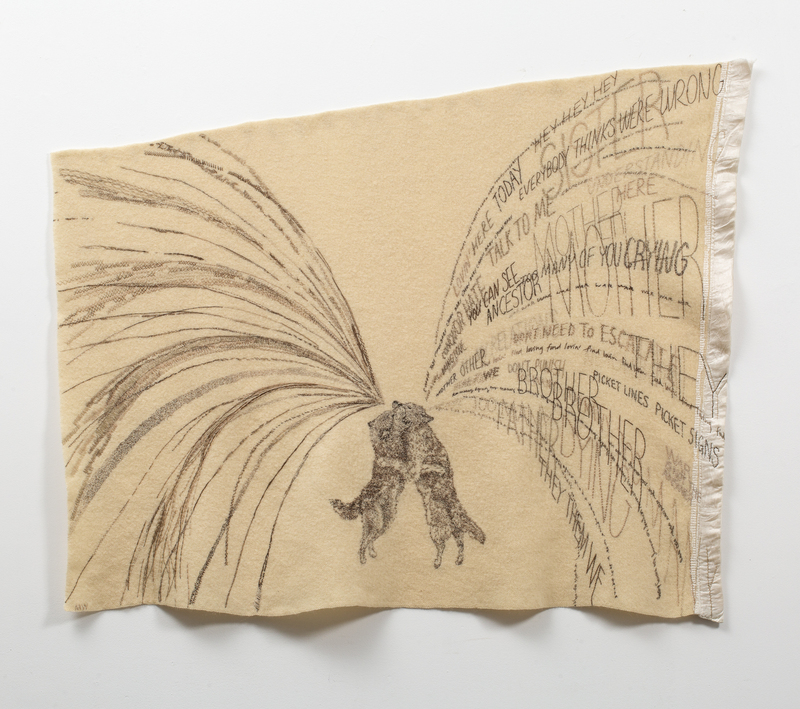 Her work draws from history, biography, protofeminism, and Indigenous principles, and addresses the interaction of the arc of history with the intimacy of memory. 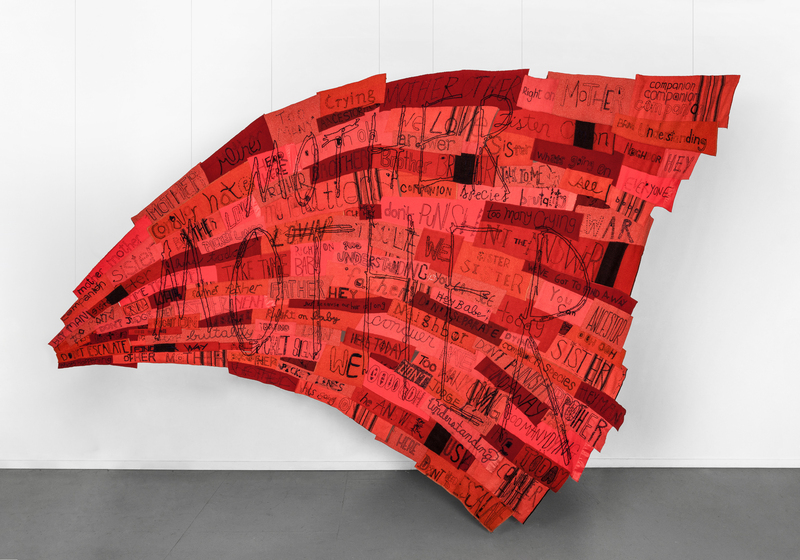 She uses materials that are conceptually attached to narrative: in particular, exploring the stories connected with commonplace woolen blankets, cedar, and iron. I’m delighted to announce Companion Species Calling Companion Species , my fourth solo exhibition at Greg Kucera Gallery in Seattle. Along with a bunch of brand-new work, I’m showing Companion Species: Underbelly , a 3,800 lb. sculpture of laminated cedar the studio made for an exhibition of the same name curated this summer by Ryan Hardesty for the Jordan Schnitzer Museum of Art at Washington State in Pullman, and realized through funding provided in part by the Samuel H. and Patricia W. Smith Endowment and members of the Jordan Schnitzer Museum of Art at Washington State University, Pullman, WA; and from The Ford Family Foundation and the Oregon Arts Commission. The wolf looks great at Greg’s, and they tell me she smells good, too; but after spending much of the spring carving her I can’t smell cedar anymore. The show opened yesterday, and I will be in Seattle for the opening reception on Thursday, 04 October from 6–8pm, and for an artist talk the following Saturday (the 6th) at noon. I hope you’ll all come out and say hello. I’m in Evanston, IL, where on Thursday night at 6 p.m., we’ll unveil Companion Species: Ferocious Mother and Canis Familiaris , a piece commissioned by The Block Museum of Art for If You Remember, I’ll Remember , an exhibition curated by Janet Dees of works that explore “themes of love, mourning, war, relocation, internment, resistance, and civil rights in 19th and 20th century North America.” The show includes works by Kristine Aono, Shan Goshorn, Samantha Hill, McCallum & Tarry, and Dario Robleto. I am honored to have been included, and it’s always wonderful to work with Janet. Companion Species was sewn in community at two sewing circles held at the Block in February of 2017. The turnout at these events was such—over 200 participants—that the final piece ended up significantly larger than planned. My thanks to all who helped: I hope to see all of you on Thursday.